This coffee-themed needlepoint design called Espresso Yourself is by Pewter and Pine. It features black lettering on a soft gold background to make a contemporary needlepoint ornament. The design area measures 4" in diameter and is a needlepoint project suitable for a beginner stitcher as well as those with more experience. Use fun fibers and stitches on this one! The design is hand-painted onto 18 mesh mono Zweigart needlepoint canvas and each stitch is painted a specific color to ensure it is easy to stitch. 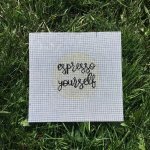 This Espresso Yourself needlepoint ornament design comes with or without fibers. If you select cotton we will send DMC cotton floss. For wool we use Bella Lusso and silk we will send Planet Earth Pepperpot boutique fibers which are single-ply for 18 mesh and easy to stitch with. 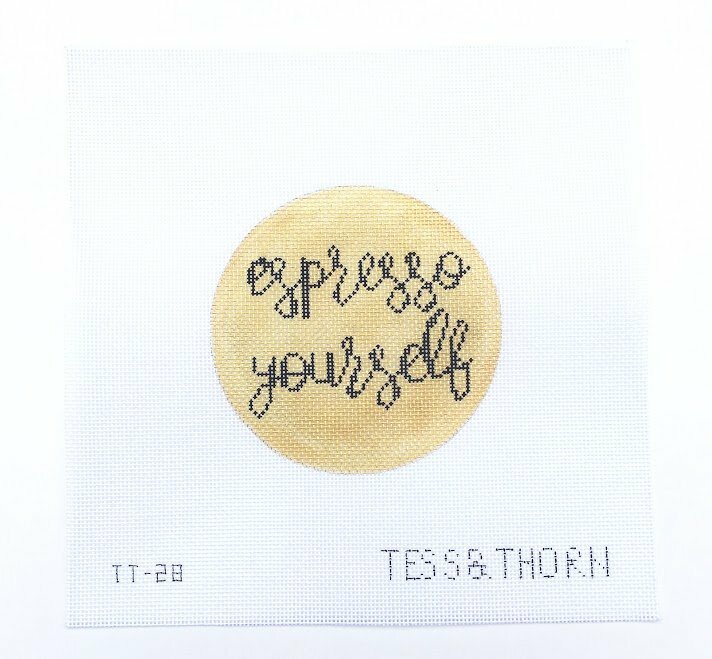 This Tess & Thorn Espresso Yourself hand-painted needlepoint canvas usually ships within 1 week.